About double the number of expected hunters trekked into Short Hills Provincial Park Saturday morning for the scheduled aboriginal deer hunt. About 70 members of the Haudenosaunee community entered the park, roughly 60 of them hunters, for the bow and arrow-only hunt, allowed under treaty rights. Initially, only 30 hunters had been anticipated Saturday. Twenty-nine entered the park Sunday. “There were more hunters than we expected,” said Paul Williams, a member of the Haudenosaunee Wildlife and Habitat Authority who helped oversee the two-day event. Many, however, left well before the evening deadline due to the rainy weather, he said. Those who were on the property but were not hunting were there to cook, supervise, and in the case of teenagers in particular, to learn about the hunting tradition, Williams said. Members of the Short Hills Wildlife Alliance, a group opposed to the hunt, took issue with the sudden increase in the number of people granted access to the park, which was otherwise closed to the public. “The Ministry (of Natural Resources) is not sticking to its word,” said area resident Robin Zavitz, one of about 40 protesters who stationed themselves at park entrances at various times throughout the weekend. “We’ve got (60) hunters in a 1,600-acre park surrounded by 100 homes,” she said, citing her concerns for public safety. The MNR created a no-hunt zone between the park and private property lines, but Zavitz said the buffer zone was breached last year and a native hunter entered her property. 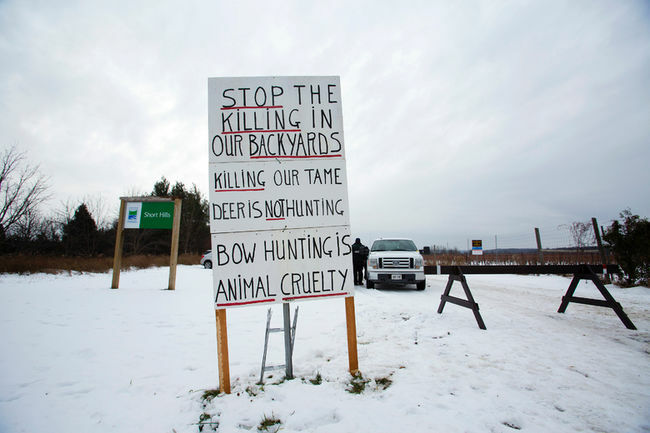 An investigation by the MNR and Niagara Regional Police found no evidence of hunters trespassing on private property. Despite the Wildlife Alliance requesting updated safety protocols from the ministry, as well as an updated map of the designated hunting area prior to the event getting underway, they were not received, Zavitz said. The hunting zone set up by the MNR runs 150 metres inside the park from the abutting property line. As the aboriginal hunters know they are “under a microscope,” extra care is taken to ensure the safety of all involved as well as the public, Williams said. In the eight years the Haudenosaunee community has been hunting within park areas, “no one has been hurt and we want to continue that record,” he said. To ensure no one entered the park without authorization, between 20 and 30 Ontario Parks staff members and conservation officers were stationed in and around Short Hills during the hunt, including at both official and known unofficial entrances, said Ontario Parks spokesman John Salo.